In a previous post, I talked about how you can build a light diffuser out of a shower curtain and wire clothes hanger. You can use this diffuser to help cast a soft light on your subjects, which helps eliminate harsh shadows and really makes the colors of your subject pop. 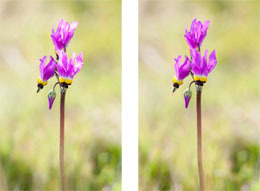 It’s especially helpful for photographing wildflowers.